Linné, C. (1753). Species Plantarum 1: 2. Ridley, H.N. (1899). The Scitamineae of the Malay Peninsula. In: Journal of the Straits Branch of the Royal Asiatic Society (no. 32): 85–184, [C. longaon p. 120]. Valeton, Th. (1918). New Notes on the Zingiberaceae of Java and Malaya. In: Bulletin du Jardin Botanique de Buitenzorg Ser. 2, 27: 1–163, [C. domestica on p. 31-34; C. longa on. p. 78-80], ISSN 0215-8906, CODEN BJBBAG. Burtt, B.L. (1977/78). The nomenclature of turmeric and other Ceylon Zingiberaceae. In: Notes from the Royal Botanic Garden Edinburgh 35(2): 209–215, ISSN 0080-4274, CODEN NRYBAD. Mangaly, J.K. & Sabu, M. (1993). 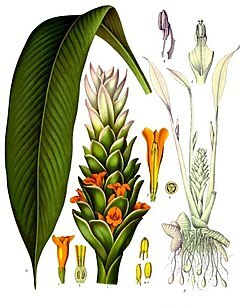 A taxonomic revision of the South Indian species of Curcuma L. (Zingiberaceae). In: Rheedea 3(2): 139–171, ISSN 0971-2313, CODEN RHEEE2. Velayudhan, K.C. & Amalraj, V.A. & Abraham, Z. & Asha, K.I. (2003). Six new cultivars of Curcuma longa L. (Zingiberaceae) from India. In: Rheedea 13(1-2): 63–69, ISSN 0971-2313, CODEN RHEEE2. Wu, T.L. (1981). Curcuma Linn. In: 产浙江瑞安 (Flora Reipublicae Popularis Sinica) 16(pt. 2): 58–64; (Chinese edition); online: . USDA, ARS, National Genetic Resources Program. Germplasm Resources Information Network - (GRIN) [Online Database]. .
For more multimedia, look at Curcuma longa on Wikimedia Commons.